***TXT US @: (419) 362 - 6200*** Navigation capable (Apple/android CarPlay), Backup camera, Automatic headlights, outside temperature, A/C, power windows/locks/mirrors, keyless entry, AM/FM/MP3, SiriusXM, auxiliary and USB port, steering wheel mounted audio controls, Bluetooth, tilt and telescopic steering wheel, cruise control, information center, 16" alloy wheels. Fuel Economy: 29 city / 37 hwy. Warranties: Balance of Kia's 5 year or 60,000 mile bumper to bumper. In service date: TBD. Extended service contracts available. 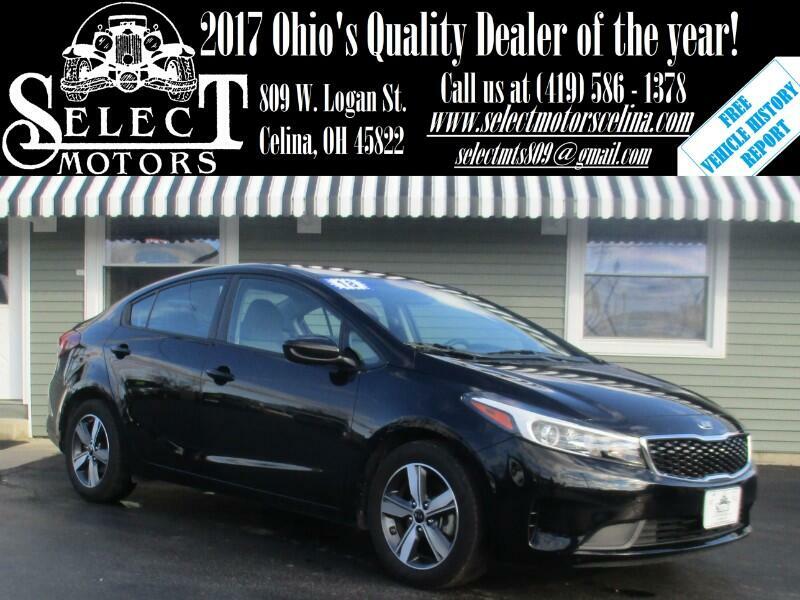 The 2018 Kia Forte is available as a sedan in LX, S and EX trim levels, while the hatchback (the Forte5) is offered in LX, EX and SX trims. The base LX trim is reasonably equipped, while the EX has a more extensive list of equipment. The S sedan and EX and SX hatchback offer some sporty touches, and the SX even comes with a powerful turbocharged engine. The Forte LX and S sedans are powered by a 2.0-liter four-cylinder engine with 147 horsepower and 132 pound-feet of torque. For most trims, power runs to the front wheels through a six-speed automatic transmission. The base LX comes standard with a six-speed manual, with the automatic available as an optional upgrade. Standard features on the LX sedan include 15-inch steel wheels, heated mirrors, air conditioning, full power accessories, a trip computer, a tilt-and-telescoping steering wheel, a height-adjustable driver seat, a 60/40-split folding rear seat, Bluetooth, and a four-speaker sound system with a CD player, satellite radio, USB connectivity and an auxiliary audio jack. Optional for the LX (but only with the automatic transmission) is the Popular package, which includes automatic headlights, cruise control, upgraded interior upholstery and trim, a sliding front armrest, a rear seat armrest, a rearview camera, a 7-inch touchscreen with Android Auto and Apple CarPlay, Kia's Uvo telematics service and a six-speaker stereo. There's also the Popular Plus package, which adds LED taillights, special alloy wheels and a leather-wrapped steering wheel.